Welcome to the web page for the St Abbs Wool Festival. Our next event will be Saturday 6th April. Updates will be posted when we have more news about exhibitors, exhibitions and displays so please keep coming back to check what's going on. 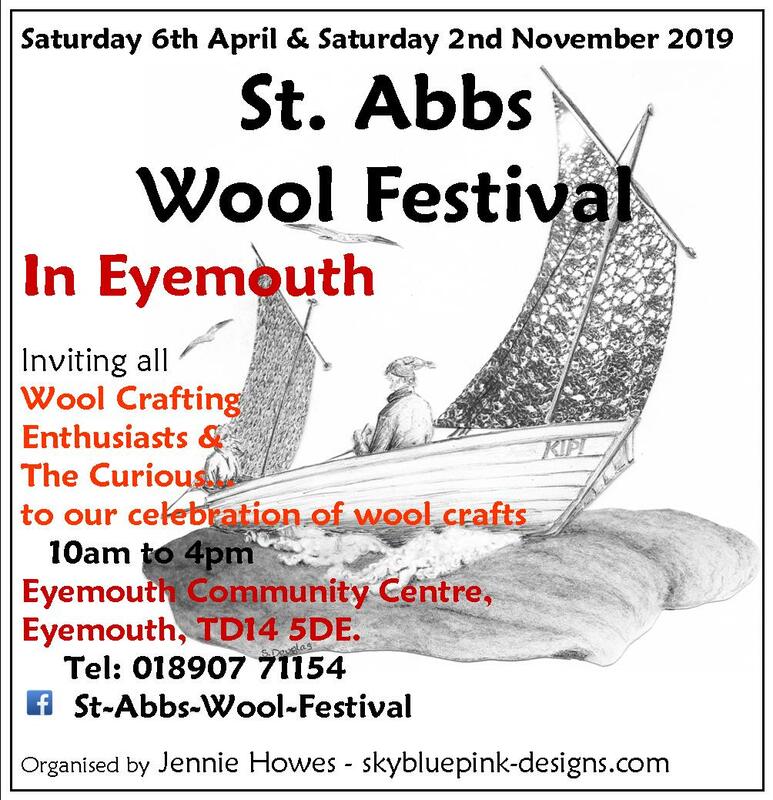 We are delighted to announce the line up of exhibitors for St Abbs Wool Festival in Eyemouth on 6th April 2019. A brief resume of each, together with links to their internet presences where appropriate. We will be posting regularly on the Facebook page with photos and more information about them all over the course of the next few weeks. We will also be updating the workshop schedule. The Coldingham SWI will once again be providing the refreshments. Demonstration room will be filled with the Monday Matters Rag Rugging group. They will be exhibiting their work and bringing all the tools and materials of the trade for you to try your hands with, so please make use of the opportunity to have a go! We always have some new faces at the wool festival and this time is no exception, so do check them out! We are once again holding the wool festival in the Eyemouth Community Centre in Eyemouth. With the extra room for more stalls and demonstrations, workshops, even a cuppa & cake - and somewhere to sit, craft and chatter we feel spoilt. ​The focus of the festival is on local professional craftspeople who we know that you visit outwith the festival - feedback from visitors would indicate that some of you bring shopping lists with you! If you want to know more about anyone, just click on the coloured text in their name (if any) and you will be taken through to their own websites or facebook pages. I will be posting photos and more information over the next couple of weeks on the St Abbs Wool Festival face book page. So, in alphabetical order and without further ado - ta da! yarn recently, which is both silky and fluffy, and completely luxurious. I’ll be dyeing this yarn in a range of colours this Spring. I also like to experiment with different fibres and the way that they can work together. I’ve been using rose fibre recently, which has an amazing sheen and drape to it and can transform wool. Anna Turnbull from Biteabout Arts is a fibre artist, making high quality, hand crafted items inspired by the organic forms, rich colours and textures of nature. She creates unique felt vessels suggestive of squash, fruits, and flower buds. Also wearable items, including hats, bags and lightweight nuno felted scarves and wraps where merino wool is felted into silk chiffon. Pictures of local wildlife are painted with merino, local wools and silk, and wet felted. She welcomes commissions and delivers workshops in willow weaving and feltmaking. Lindsay Roberts aka The Border Tart and Blue Moon Indigo. The Border Tart always likes to have something new to add to the mix! So yes to all those shades of indigo on lots of different yarn bases, of course, and British wool batts for spinners and felters, as you’d expect. But expect new yarn shades, additions to the button selection, a simple colourwork knit-kit... All these and more are works in progress at Tart HQ! Jane & Keith Jackson from Brightseed Textiles are back. We will be selling needle felted Harris Tweed pictures and greetings cards and prints taken from my work. Based in rural North Northumberland, Jane is a textile artist/maker who creates highly distinctive and colourful needle felted “paintings” from Harris Tweed and wool yarns. Jane’s work features the landscapes, landmarks and wildlife of the North of England and Scotland. Jane’s work was featured this year in “Womankind” a bi-monthly cultural magazine. She also held a solo exhibition at the Bakehouse Gallery in Alnwick this summer. All of Jane’s work is available as greetings cards and prints and you can see her full range on her website using the link above. Laura Brittain is a designer, feltmaker and teacher, based in the Scottish Borders. She will be at St Abbs Wool Festival in Eyemouth, with her beautiful felted pictures – based she tells me on views from her workshop window – hearth rugs, bags, baby bootees and the tiniest needle felted teddy bears - possibly in the world! Sandra Nicol from ﻿Chandlers, ﻿brings hand dyed & handpainted wool….new yarn bases will be launched at St Abbs & we will be developing several new colourways exclusively for the Event.. We are currently working on new patterns with Katherine Lymer, which we will be launching as kits... A selection of new Crochet patterns will also be available. A great favourite in April and returning this time is Lynn Elliott of Elliott's Shed based in Langholm. Lynn weaves the most beautiful tweeds on his Hattersley loom, using British wools, in colours so clearly influenced by the landscapes which surround him. Read more about him by clicking on the coloured text above. I'm sure that you are going to love his fabrics. Janis Embleton from Flight Weaving Janis’ fabrics are made into range of items to suit all pockets, from key fobs for just a few pounds to luxury scarves for both women and men from £80- £200. You can also buy a selection of hand woven affordable gift items such as notebooks; zipped pouches, lavender pillows, framed fabric artworks and, if that’s not enough to tempt you, gift vouchers are available which can be used towards any of the products mentioned or in payment for weaving lessons. Janis is a designer and hand weaver of luxury fabrics with many years’ experience, having completed an Honours Degree in Woven Textiles; she spends her days weaving her fabrics for sale, both direct and on-line, working on private commissions or teaching a new generation of weavers. Janis only weaves in natural, luxury yarns, from indie-dyed silk from Yorkshire, Scottish cashmere, Irish linen and Northumbrian alpaca to upcycled wool and silk destined for land-fill. Returning after a brief absence, Judith Goodfellow of FineFettleFibres will be bringing a great selection of British (and a little Fair Trade) yarn in natural fibres, mainly from small, independent UK producers. With more stock of single breed yarns to promote the rich diversity of our native sheep breeds and to do her bit to support the British wool industry in challenging times. With patterns, kits and some sample garments and accessories together with promotional material for her 2019 workshop programme. Welcome back Judith! Amy Davidson is also new to St Abbs Wool Festival with her business Fluffy Felts. Amy is a painter in wool, creating needle felted and wet felted paintings – birds are a favourite, with landscapes and wildlife being the inspiration for the majority of her work. She creates both 2d and 3d pieces. As well as her felted works, she also takes commissions and teaches felting workshops in East Lothian. Helen & David from Hame Made joined us last year for the first time and I think sold just about everything on their table! They established the small business Hame Made in January 2016. Helen designs and hand knits 100% pure, superior quality cashmere. With David's 30 years’ experience in the Knitwear Industry in Hawick their home town and Helen's long history of working within the knitwear industry but from a retail point of view. For the last 7 years she has also worked in Borders Textile Towerhouse. Sue Horn from Hawkshaw Sheep will be bringing Hawkshaw Sheep Yarns and Tweed cloth produced from the fleeces of our own sheep, in natural undyed colours. We also have roving from different breeds of sheep, suitable for hand spinners and felting. New this year are hand dyed mini skeins, dyed on coloured bases which give lovely more muted colours, these are available in various weights. I am also working on producing some hand dyed variegated yarn in 4 ply which will be available at St. Abbs. Lucy Robertson of Jeanie Bags will be here with her fabulous range of hand made bags. Every Jeanie Bag is designed and made to order by Lucy Robertson, a trained saddler and self-confessed perfectionist who’s passionate about using fine British tweeds, plaids and other fabulous fabrics. Each bag style comes in a gorgeous selection of designer tweeds, plaids and checks, with complementary trims, and is lovingly handcrafted at Lucy’s Kelso workshop. But Jeanie Bags are not just beautiful. They’re well thought out, robust and spacious, with generous zipped pockets and practical feet to protect the base, with a sense of fun to make them stand out from the crowd – just as you’d expect from a practical countrywoman! With some new styles to complement her existing range - an update of the Sonsie Shopper now has very useful outside pockets and a new small body bag for the “grab and go girl”. We will be forming an orderly queue Lucy! ​Suzie Vestri is a shepherdess in the Lammermuir Hills in East Lothian. She trades under the name Lammermuir Wool, which is home-grown, single-farm wool which is 100% Shetland wool. "The wool comes from our Koru Lammermuir Flock. We believe that well-tended land and loved sheep makes for superb wool. This fine, soft wool is hand-sheared and mill-spun into a range of practical weights from single-ply to Aran weight; available in a palette of natural and hand-dyed colours which reflect their origins. I will have available: Spun yarn in the following natural shades: white, dark moorit and greys. In single-ply, DK and aran weights. Hand-dyed yarns in a small palette of shades based on local landscape. I will also have a small number of raw fleeces for sale at the event." Eta Ingham Lawrie will be delighting us all with her beautiful free from weaving, crochet and knitting! With woven landscapes, mohair jumpers and cardigans made from handdyed yarns and decorated with freeform crochet motifs, woolovers to keep everyone warm, and an amazing range of dolls, and crocheted decorations for the festive season. Plus a workshop – more details to follow! Natural Born Dyers is a regular favourite at our festival, they supply naturally dyed yarn and fibre.Jon says that "Our yarns focus on the finer end with our Lustrous range of 55% Bluefaced Leicester, 45% silk coming in 4,3 and 2ply weight. All the BFL for this yarn is British. To complement our yarns we also sell a number of patterns, both our own and some from the shawl designer BooKnits. As well as being able to peruse this range of patterns, visitors to our stall can also see many of them knitted up. For November we will have new patterns and samples. We also offer a range of hand-turned tools for knitters and spinners including our unique spurtzleur spinning tool. Late in 2017 we added mini-nostepinnes and new-style shawl pins to our range. New items include natural edge wooden buttons and we currently have prototype yarn servers and plying tools which will be developed into new items over the summer." Jane Hall from Pinkminis is back again – you all seem to love her clothing judging from the number of folk wearing it! Speaking with Jane recently, she told me " I am a designer/maker of ladies clothing and accessories. I’ve been a sewer as long as I can remember – my Sindy doll had a vast array of 1970’s tabards, then a Christmas present of a “Little Betty” sewing machine led to more complex garments with gathers and finished hems!! My clothing range now is a bit more accomplished but hopefully, still has an element of fun in it. Skybluepink Designs - yes, I’ll be there too! With my curiously collated collection of all manner of things woolly, from hand spun yarns, supercoil necklaces, spinning and felting fibres - tops and batts - lots of colours and beautiful natural shades from many different breeds of sheep, garments, accessories and homeware - made from said yarns and fibres, hand woven throws and rugs made from recuperated textiles, the largest assortment of wooden buttons I’ve ever had, bamboo knitting needles and aluminium crochet hooks that will make the tables groan! I will also be promoting my new workshop schedule, so if you fancy getting up to some woolly fun, just pick up a brochure! Jack McDonough from TurnedWood Studio is also new to our festival. Jack is a wood turner based in newcastle who works only with trees sustainably sourced from Northumberland. He makes "green turned" yarn bowls, which means he shapes the wood before it has been seasoned (dried). He then slowly drys the pieces out, sands/polishes them and finishes them with a home made organic finish. The wood shifts and twists as it dries which makes each yarn bowl unique in its own special way. Finally, we have The Woolclip, our friends from Cumbria making the trek from west to east to join us again. A co-operative group of crafters from all woolly disciplines are joining us again with their eclectic mix of beautiful wool products, all handmade with love. They are of course the group who organise "Woolfest", one of the nicest events to both visit and take part in! Here's a little map to help you find us!